Martin Hassan was forced to leave Kadugli when the war reached the Nuba Mountains. Because his uncle Yousif Kuwa had openly joined the Sudan People's Liberation Army, the police and army clamped down on the family. Martin fled the country and only came back in 2005. Now a young business man, he tells his story and speaks of new opportunities. My name is Martin Hassan Juma'a Karno. I'm a Sudanese from the Nuba Mountains. I was born in Kadugli on May the third, 1976, here in Kadimo, in this very house. My tribe is Miri; my father is from Miri Berre and my mother is from Miri Juwe, Kusli. She is a sister of the late Yousif Kuwa Mekki. I grew up in Kadugli, in different quarters; I stayed some time at my uncle's house and also with my grandmother at Khar Hajr. My father was away often; he was a teacher so he went to different places, cities. We used to follow him; I studied at ten different schools, in Khartoum, in El Obeid, in Damik and in Kadugli of course. I finished higher secondary school; I went to University but left after one year. Later I learned to speak Russian and Dutch. Next year I would like to take up university again. When the war started in the Nuba Mountains, in 1988, I was still here in Kadugli. We had many problems, especially my family, because of my uncle Yousif Kuwa. The police arrested many of my relatives. My uncle, my mother, my father; any day we would hear that another of our relatives had been killed or had disappeared. No one knew where they were: did the police take them, or was it the army? The people that were killed were brought into town. I saw many of them. The soldiers execued them and brought them into town; they left them in the field for the other people to see. Two days, three days. Do you know the field near [Governor ISmael Khamis] Jelab's office? There, or else at Mek al Hajr, or near the military camp. People of the Sudan People's Liberation Army (SPLA) had come from across that mountain and they fought with the army. Some of them were wounded. I was there; I saw those people. The soldiers questioned them, they wrote down the answers. Then they said: "boys: step back!" And they shot them. I saw it happen: six or eight men; near my house here. The whole family left as soon as they could; my father was the last to go. Someone said to him: "you stand behind Yousif Kuwa, but now that Yousif is gone: what are you going to do? I will show you what we will do to you!" My father feared for us so he got a lorry from the market the same day. He loaded all of our things and we left to El Obeid. From there we went to Um Ruwaba. I studied there, while my father was working as a teacher in different towns in North Kordofan. We had problems in Um Ruwaba too. People would come from Kadugli; they harassed us, saying we were SPLA; we were mutineers, and so on. It wasn't easy. When people found out that Yousif Kuwa was my uncle, I got into trouble also; they started threatening me. I left Sudan in 1994. I went to Egypt and worked there for a while. When I had saved some money I traveled to Saudi Arabia; I bought some commodities there and returned to Egypt to sell them at a small profit. I got a visa for the Ukraine and lived there for a while. It was a hard time but I learned Russian at the school for refugees and I made some friends. After that I went to the Netherlands. I arrived in the Netherlands on May 12, 1998. Within three months I received a full refugee status and two months later I had my own single room apartment in Leiden. I followed a language course for refugees at Leiden University. I started doing voluntary work at the refugee centre in Leiden and also at the Refugee Assistance Office. I did that for six years. For a while I was working as a deejay. Since I was young I love western music; I don't know why, but I never liked the Sudanese music. When I came to Holland I listened a lot to hip-hop, rap, R&B - every song used to give me a small message. That was something I never found in Sudanese music. Then I decided I would be a deejay. I bought all the equipment, I started organizing parties at the refugee centre in Leiden and played there every Wednesday. In the end doing business took too much of my time. It started at a small scale. I bought cloths from someone and sold them at the refugee centre. I would make five or ten guilders here and there, small money. Then I started to import cheap commodities from Poland and the Czech Republic, through friends. I made some money and after that I went to Thailand for four or five times to buy things there and sell them in Holland. I didn't know anyone in Thailand but people who had been there told me everything was very cheap, so I went. After a while I learned from people in Thailand that China was even cheaper, and the quality there was better. So I went to China. I have an office there now, in Guangzhou. Getting around wasn't that difficult. I learned a lot from my voluntary work: the refugee centre house people from 45 different nationalities. I met so many different people that it has become easy to make contact with anyone. By the time I went to China, three years ago, I was selling things to friends in the Ukraine, Poland and the Czech Republic. I also imported goods for friends in Canada and London. I didn't do business in Sudan though, until very recently. I only came back to Sudan on September 6, 2005. Seven months ago. I hadn't seen my mother in eleven years. My father had passed away in 2004. It was really exciting to get on that plane to Sudan. I came from China and I hadn't called anybody that I would arrive. I didn't know where my mother was living, I didn't remember the people. In Khartoum I got a telephone number of a cousin. He came to pick me up at three o'clock in the morning, and he took me to my mother. She was asleep when we arrived, so I woke her up. She started crying. It was very good to return, people were so happy to see me. I went to my aunt in El Obeid and then to Kadugli - the first time in twelve years. The most important result of the peace agreement is that people are happy to return. They return to the town and they are safe. Before, no one was safe; you could die at any moment. You couldn't sit outside like we are doing, talking at this late hour. You couldn't listen to music the way we do now. There was no light; all doors were closed. Some people slept under their beds, others left their house to sleep somewhere else. Now you can walk the streets at night; it is really safe. That is the most important thing. The chances of lasting peace are still small; there is a very big gap between the Sudan People's Liberation Movement (SPLM) and the National Congress Party (NCP). 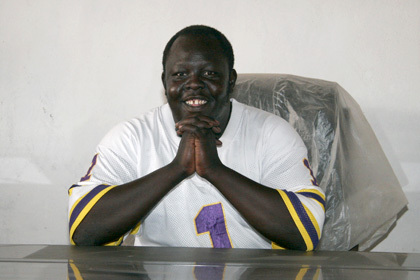 Moreover many people, whether they are SPLM or NCP, do not really want to work for their people. They only think of making a career: if they don't find it here, they will try with the other party. It doesn't matter which side they're on, and this is bad for the people they are supposed to represent. [These opportunists] will only create problems: if they don't get their nice careers, no job, no ministry, they will join the other side. They don't know anything about the parties; they only know how much money they want. In the end it doesn't matter whether you are with the SPLM, with the NCP or any other party; as long as you work for your people. I'm a member of SPLM myself, but I'm not active. When I returned, many people were afraid of me; they thought I would be a commander in the SPLA. Of course everyone knows that Yousif Kuwa was my uncle. Of course I'm SPLM. But I have nothing to do with the army and I don't want to be involved in politics: it's bad for business. And still it creates a lot of problems. People are talking about me. They say I do business for the SPLM or the SPLA; that the SPLM would give me money or give me support; that the party would exempt me from paying taxes. None of it is true. I would be happy though if the SPLM would give me money to invest for them: I would be really happy. Now people say the money I have can't be mine, but I've had help from friends in Holland and in the Czech Republic. So when I make a profit, I give them their share. For the coming two years I just want to do business. I would like to pick up my studies as well. After that I would like to become involved in politics; in the Nuba Mountains to begin with. We don't know what the future of Sudan will be, so I will begin working for the people here. There is some development in Kadugli, but I think it's nothing if you look at how much money people here receive for reconstruction. And there is the two percent of the oil money. Why don't the politicians use it to develop the town? The public buildings are so old: thirty years, forty years, fifty: why not use the money to rebuild them? I was discussing it with [Governor Ismael Khamis] Jelab. I would like to invite him to Europe or to South Asia, to take a look around, to get some new ideas. Now they want to rebuild Kadugli just like Khartoum, but I don't think Khartoum is a nice example: the city is really ugly! I hope Governor Jelab will visit Holland to see how beautiful the country is. Or that he goes to see Guangzhou, Singapore or Malaysia; I hope one day Kadugli will be as beautifull as those cities. Maybe, in my time, I can realize it. The Nuba Mountains is a beautiful place. European investors could create wonderful tourist resorts; they can do business here. I really prefer Europeans. From experience I know they are more honest than people from other places. Some time ago I spoke with Mek Mohamed Zaki [from Miri]. He had been negotiating with a Turkish investor, and he was ready to give him land and business opportunities for tourism, hotels. He wanted to give him this beautiful place at the Miri lake; let him do there as he pleased. But I told him: "you have to wait a little while until people from Europe come to invest. The war has just finished, you have to give people a chance." To the people who are still outside the country or in the cities in the North, I want to say that you should return home to the Nuba Mountains to help rebuild the society. The people here really need help. Maybe you think "I don't have money; what am I going to do I the Nuba Mountains," but you can do a lot. Hundreds of organizations are active here; you can find jobs with a good salary and your relatives and friends can help you to get started. I left Holland; Holland is beautiful but I returned here. We can work together and rebuild the region. This is what I hope for. This is the time, really, to return.